August is almost over which means peach season is quickly fading away. While you can still easily find peaches through most of September, its not the best time for them so I usually rush in some last minute peach recipes in the beginning of September and then save the rest for the following year. No guarantees, but this is currently my final peach recipe for the season and I figured I may as well end it with something pretty and tasty. 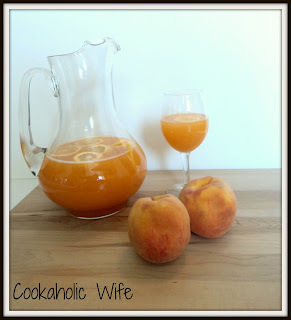 Before seeing this recipe I honestly never thought of adding peaches to lemonade. I guess just because its not as common as regular lemonade or strawberry lemonade. However, its equally as delicious so I suggest you run out to the store and get the ingredients to make this right away. 1. Score a “X” in the bottom of each peach. Place them in a large saucepan and cover with 4 cups of water. Bring to a boil, then remove the peaches and place in an ice-water bath until cool enough to handle. Peel the skins off the peaches and then roughly chop them. 2. Rinse out the saucepan. Add 4 more cups of water, the sugar and the peaches. Bring to a boil then reduce the heat and simmer for 3 minutes. Remove from the heat and let stand for 30 minutes. 3. Pour the peach mixture into a blender and blend until smooth. Discard any large solid pieces and refrigerate for 3-4 hours. 4. Combine the peach mixture and lemon juice. Add the remaining 2 cups water, adjusting to reach your desired consistency (it should be somewhat thick). Add the lemon slices and adjust with sugar to taste if necessary. 5. Refrigerate until chilled or serve with ice. I could go for a tall glass of this right now. Sounds fantastic! Fantastic lemonade! Love that it uses seasonal fruit (the peaches here are fantastic right now)!